When I stepped out of my car, I could hear the stream gurgling while it ambled down the hollow a few dozen yards below me. That is a welcome – and somewhat unusual – sound in the Blue Ridge mountains in early September. However, this summer has not been usual. According to the United States Geological Survey, the South Fork of the Shenandoah River has been over five to six hundred cubic feet per second above the yearly average out summer. In short, we have had a lot of rain, which means abnormally good late summer flows for mountain streams in the Shenandoah Valley. Since I knew the water would be relatively good, and the fish I caught would not be stressed, I decided to cast a fly on a couple mountain streams. The first stream I fished was Madison run, which parallels Madison Run Fire Trail. From the parking area and upstream about a mile and a half, the stream is flat. I knew there would be good water through this section because I have run on the fire road dozens of times. However, it had been a while since I fished there. After setting up my rod and talking to a hiker in the parking area, I started up the trail. The water level was good from the start and made me feel optimistic even though it was very clear. That optimism faded quickly. After walking half a mile, the stream began to get very small and shallow – then disappeared completely. I was confused. How can a stream look so good and then be a pile of gray, dried rocks? I turned around. Walking back, I passed a couple I had talked to on the way up the trail. They asked me why I was leaving so soon, and I explained that the stream was completely dry. The man, who evidentially knew the stream much better than I did, explained that it does that every summer but assured me it does come back. He told me the flow would be much better if I entered the stream across from the next hiking trail. I started walking up the trail again. After I reached the trailhead, I turned down a small path that lead me to the stream. It was in good shape again. To my right was a big, still hole full of trout. On closer inspection, there was also a water snake laying on the bottom of the pool. I peeked around a tree to get a closer look as the snake chased trout around the hole. However, he was never quick enough to catch a wary trout. I fished upstream from that hole and had better luck than the snake. The topography of the stream was interesting at that point. There were broad, stair step like pools, with moderately fast water, and each of them held a trout that was interested in my fly. The next stream I fished was Paine Run. It had a bit more gradient than the section of Madison Run that I fished. I did not have to hike nearly as far to get to good water either. Paine run was narrower than Madison run and had much more pocket water. The trout were also more numerous. They were also much warier. I was moving fish with almost every step. After slowing down my approach immensely, I was finally able to get a few casts on fish that were not spooked. It is important to remember that you will never scare a fish by moving too slow or too quietly. 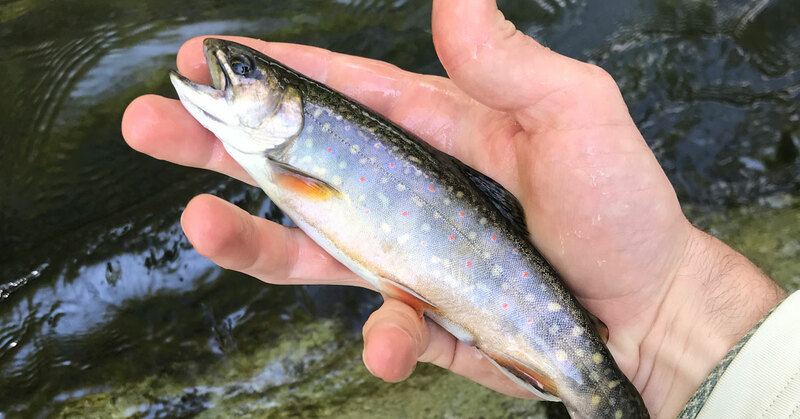 With that approach in mind, I fished my way up the stream through miniature waterfalls, staircase pools, and flat pools that are summertime haunts for trout that snubbed their noses at my fly like it was a piece of drift wood. I had to make long casts that landed gently on the water. Any ripple from the fly when it hit would result in black streaks scattering through the pool. Eventually, I was able to connect with a couple fish. Although late summer native fishing is challenging, good flows make it worthwhile. Plus, every time you catch a fish, you get the satisfaction of knowing that your approach and presentation were nearly perfect. After all, that is one of the aspects of native trout fishing that make it so special. Fishing aside, late summer and early fall are special times to be in the mountains. During those times, I have witnessed trout spawning in quiet pockets of water, choruses of owls calling late in the evening, and now, a water snake chasing trout through a pool. Any season of transition is special, but summer moving into fall is significant because all life is moving from electric heat and buzzing cicadas to cool, still silence. Life is eagerly winding down. As trout anglers, we should participate in this eagerness. Looking to Plan Your Own Adventure?